How do you build a complex body plan starting from only a single cell, the fertilized egg? How did highly evolved animals, for example vertebrates such as ourselves, first arise? How does the misregulation of developmental regulatory pathways lead to diseases like cancer? 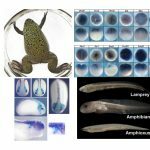 These are fundamental questions that my laboratory addresses through our studies of a single vertebrate specific cell type, the neural crest. Neural crest cells are multipotent stem cell-like embryonic precursor cells that migrate extensively and give rise to an amazingly diverse set of derivatives in vertebrate embryos including most of the peripheral nervous system, melanocytes, craniofacial bone and cartilage, and smooth muscle. 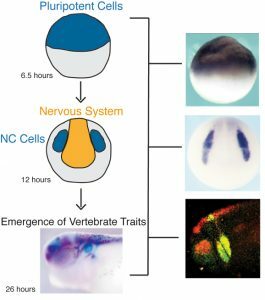 This remarkable diversity makes the neural crest an exciting system in which to investigate the mechanisms which stem cells use to make decisions about their fate. 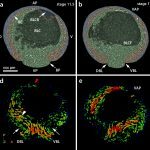 Work in my laboratory has addressed four central questions: 1) what directs the formation of this stem cell population and controls how longs it retains it stem cell properties? 2) what controls when these cells will being migrating? 3) how are neural crest cells eventually instructed to form one one specialized derivative cell type out of the range of possibilities open to them? and 4) How does the misregulation of neural crest regulatory factors contribute to tumor formation and metastasis? We address these questions by utilizing a number of cutting edge approaches including genomics, proteomics, and quantitative imaging. As part of the NSF-Simons Center for Quantitative Biology we are focusing on the temporal dynamics of cell fate decisions, and understanding these processes at single cell resolution.